You’re going to want to watch this fiery conversation about Tesla. 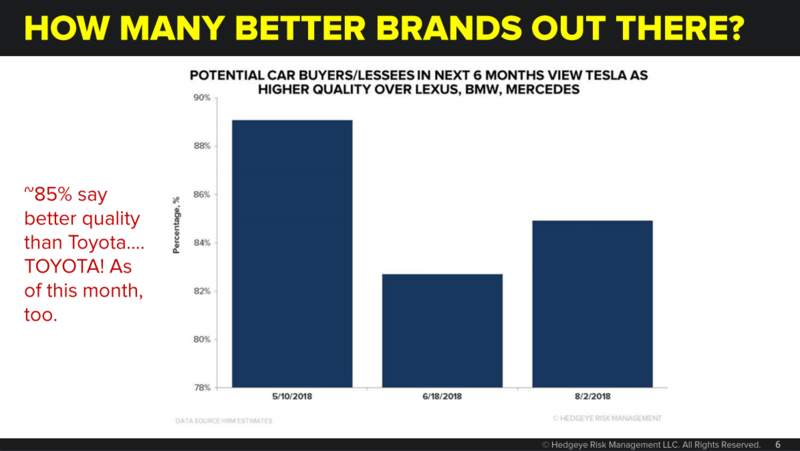 In this special webcast, Hedgeye Industrials analyst Jay Van Sciver discusses what lies ahead for Tesla and its embattled CEO Elon Musk with outspoken Tesla critic Chris Irons, founder of Quoth the Raven Research. Below are key excerpts transcribed from the interview. Click here for access to the entire 52-minute discussion. Van Sciver: One thing I see in social media is an echo chamber of short information. And I think a lot of people miss what the long community, who actually own Tesla, think. We are an institutional research provider. I meet with people who own Tesla shares. I have a much better sense of what these investors think, their vision, and why they stick with Tesla and where it goes. I think there’s an assumption that longs are idiots and don’t know how to read an income statement. But that’s not true. And I think oftentimes the short community focuses on the wrong metrics. Earnings revisions, for instance, haven’t worked. Tesla earnings have been revised for years and it’s not new. Tesla loses money is not news to the people who own it. They also burn a great deal of cashflow. Not news. Not a metric the longs are focused on. Realistically, if you’re going to commit accounting fraud, you should at least get there by presenting a profit. Accounting fraud is something that, if Tesla is doing, they’re not particularly good at it. If you look at Enron, for instance, they were reporting a profit. Tesla is telling you they lose gobs of money and burn gobs of cash and that’s not really the point. The shorts vastly underestimate how strong the Tesla brand is. This is the core. About 90% of people surveyed think that Tesla has better build quality than Toyota. Mind you, most manufacturers, not just car manufacturers, have adopted strategies from Toyota, Lexus, people like that. What we see is, in fact, the brand is so strong people think Tesla is doing a better job. Of course, we all know that this is not entirely accurate but that’s the brand perception and these are potential car buyers. This is amazing to me. This shows the number of people who have heard negative things about Tesla and its cars in the last 6 months. Incredibly, in these last three surveys, we’re showing 3%, then it goes to 7.5%, then back down to 6.5%. What we hear as a short doesn’t filter out all that well to the general public. Van Sciver: So Chris, I’ve presented the long thesis. Which of these things I’ve presented is the most vulnerable? Irons: I want to address two things that struck me as worth mentioning. The first is that Tesla isn’t going to issue equity because it doesn’t want to go against its own guidance (that the company is going to be profitable). I would just remind everybody that the last time they did financing and sold that junk bond the stock was at $350 and that was prior to this whole mess. It certainly looks like the company chose to go the debt route so they could say, ‘Hey, we’re not diluting,’ even though they’re leveraging. Or, there may not have been demand for it. I certainly found their last bond issuance very peculiar. Nobody I talk to seems to be able to figure out the value of issuing this paper when the stock is $350 per share. That’s number one. The second thing I’d like to address is the idea that the board is not going to fire Elon Musk because it would be bad for the stock. I’m sorry that it’s inconvenient for the board to do their job, but there needs to be some governance and accountability. The problem here is that the board has been beholden to Elon Musk,not the shareholders. What we saw in the recent new pay package, and I did a whole podcast about this, I personally thought was an insult to everyone’s intelligence. Because all of the milestones were arbitrary, like a market cap of $100 billion. None of it had anything to do with cashflow or net income. The point of the matter is, when you already have a company that’s valued at $50 billion, you don’t have to do anything productive to turn it into a $100 billion company. Elon Musk has created a massive legal liability for them. And I think what has been a board of complacency is starting to wake up. Van Sciver: If you were on the board what would you do? What would you do to reign him in? Irons: The first thing that I would do is talk to my own personal counsel and try to act as conservative as possible to cover my own a** first. If I had to stay on the board, this is exactly what I’d push. Elon Musk has to step out of the CEO role and has to move to a non-executive chairman role, number one. We have to get somebody that has a background of success on the Street, somebody with some pedigree and a brain who knows how capital markets work. Then I would withdraw any and all guidance I’ve ever made and sit down with the rest of the board and put forth the most conservative estimates possible. Van Sciver: I don’t think Tesla’s corporate communication is the core problem. I think the fundamental problem is that they aren’t willing to acknowledge that they are a manufacturing company that needs to develop a manufacturing culture of lean production, continuous improvement, stable design of a car that they can then optimize around, go through a normal development cycle where they test and perfect the product before they go into mass production. It’s on the operating side. Irons: Let’s talk about operations. I have a big problem when Musk comes to market and says, ‘I’m going to be able make so-and-so number of cars at so-and-so rate.’ I think in 2017 he was saying he’d make 20,000 of these cars per month by the end of the year. You’re supposed to be making relatively conservative estimates that are rational. To come out and make that type of a statement last year, and then two days ago we get this report that clears up what ‘Factory Gated’ meant. It meant they built 5,000 cars and 4,300 of them needed to be reworked. Tesla thought they were going to be so highly advanced in the way they produced these vehicles, that it was going to blow away the best practices of the industry and re-write auto manufacturing as we knew it. This company has been pitched as a company that is going to revolutionize the way auto manufacturing has been done. The reality is that they are scraping together crap to try to meet the goals they put together. These are two completely two different things. And if the market ever valued them as a traditional auto manufacturer, which is what they are, and if they ever go profitable, all you have to do is compare Tesla’s valuation to Ford. Unless there’s something huge that I’m missing here this company. What makes this company a $50 billion market cap? Otherwise they should be trading at 7 or 6 times earnings like GM. They are a nut and bolt auto manufacturer. And if that’s the case, the valuation collapses. Click here for access to the entire 52-minute video discussion.